Description: PP polypropylene honeycomb core exhibits a unique cell structure. The core has 3 orientations vs. the 2 orientations common with other honeycomb, making its properties more uniform. Each cell has a tubular form and is inherently stable. 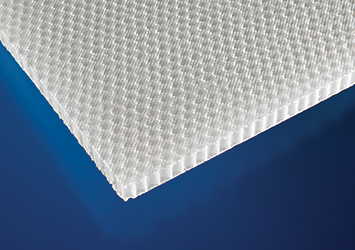 PP polypropylene honeycomb is supplied with or without a non-woven polyester veil for better bonding. It is also supplied with or without a film barrier under the polyester veil to limit the amount of resin consumption. Applications: PP polypropylene honeycomb uses include sandwich panel cores, energy absorption and filtration media. PP polypropylene honeycomb is available in the following standard dimensions. Also available as Kit Cuts™.